The Trustees of the Worshipful Company of Glass Sellers Charity are delighted to announce that Shadman Khan is our new Glass Sellers’ Scholar. He is reading medicine at University College London having achieved great success in his A ‘levels while at City of London School. 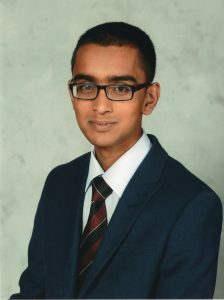 Shadman achieved a Distinction in Cambridge Pre-U Biology, A in Mathematics, Physics and Chemistry and A* in his Level 3 extended project. Shadman was interviewed by Chairman of the Charity, Professor John Whiteman, and Trustee, Maria Chanmugam, who were very impressed by the dedication, maturity and social awareness of this remarkable young man. The Trustees have agreed to support our Glass Sellers’ Scholar on the same terms as the Abbott Scholarship bursary. Shadman’s ambition is to be a surgeon. He is particularly interested in cancer and genetics. He says “it is not just the science of these diseases than intrigues me but also the personal impact these have on patients and their families – l nearly lost a loved one to cancer. UCL is renowned worldwide for its research and I want to get involved with this, reaching a point where I am leading teams that are tackling some of the world’s most pressing health problems”. Charity and giving back are very important to Shadman. He says ” coming from a humble background I know what a difference it makes when people inspire and support someone to try and reach their most ambitious goals. For this reason I want to get involved in mentoring children and teenagers from less well-off backgrounds and help them reach their full potential. I was able to study at an excellent secondary school with the help of a scholarship and if I get the opportunity I would like to help others in the same way”. When qualified he is also keen to volunteer his time and skill to helping people in the developing world who do not have access to basic healthcare and also those affected by disasters. Shadman says: “I would like to thank the Worshipful Company of Glass Sellers. Your help has allowed me to pursue my ambitions with renewed vigour. Thank you. I look forward to learning more about how glass is used in medicine and surgery and incorporating some of these ideas into my own work”. We look forward to welcoming Shadman at dinner in due course.